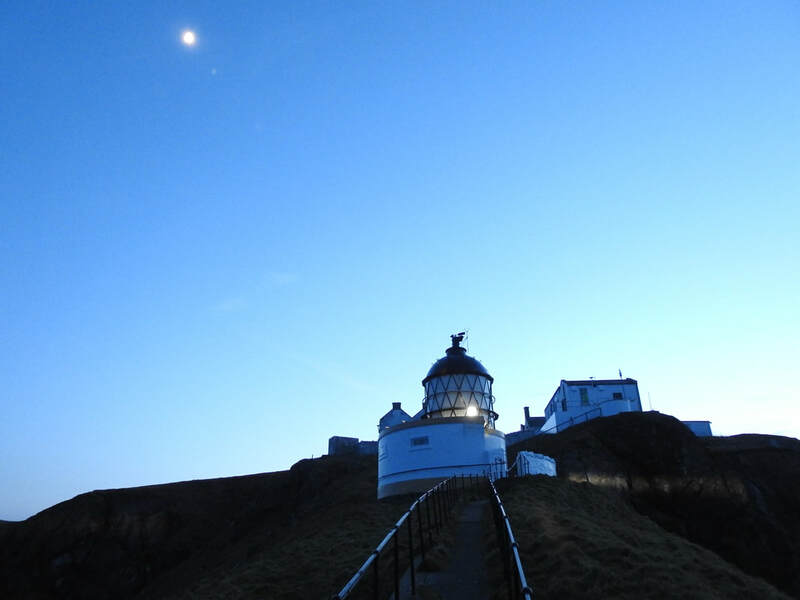 The latest Following The Lights exhibition has been set up today (March 16, 2019) and will be supporting the local community at St Abbs Head Visitor Centre for the whole of the season along with the St Abbs Head RNLI, nice to hear about the filming in the local area for the new BBC Blue Planet live. 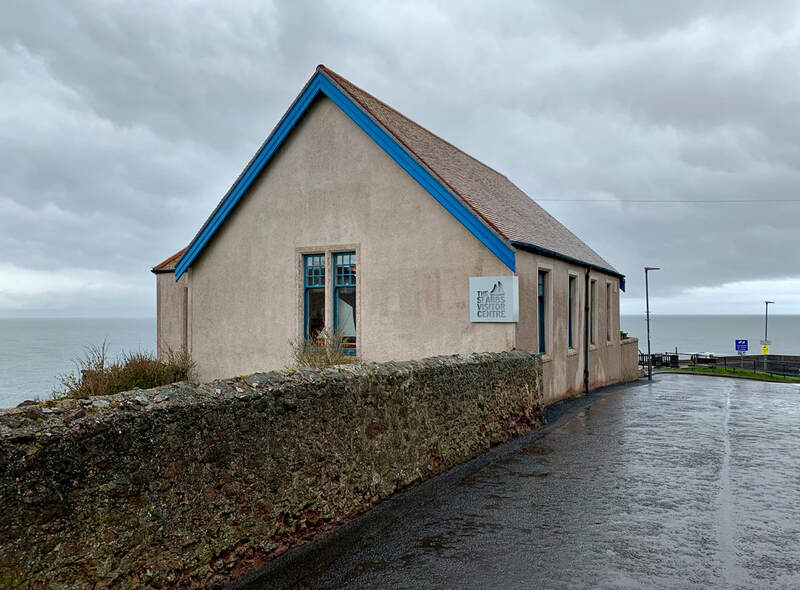 The exhibition will be starting on the 1 April 2019 at St Abbs Head Visitor Centre for the opening day of the season. This will be the longest exhibition so far a total of six months, running until October 2019. The exhibition will be complete with rotational items, changing every few weeks, new items have been added to the collection and have not been seen on public display. Come along to see the film location of the new Marvel Avengers movie! Take your selfie picture with the lighthouse keepers uniform and hat on, post to the social media pages, see the new exhibition items never before seen at any of the previous Following The Lights exhibitions, including rare items from the Clyde Lighthouse Trust (not in any museums) and the collection of Fresnel Lens including 3rd and 5th order! Short videos will allow you to learn some interesting facts about the local lighthouse, along with some hands on learning with stereoscopic cards displaying the Stevenson lighthouses and Edinburgh in the 1800s. Touch and hold the actual granite and blonde sandstone stone used in the building of two of the Scottish Stevenson lighthouses dating back to the 1800s when the stone was quarried and the stone masons worked their magic! This is sure to be the best way to spend the summer! 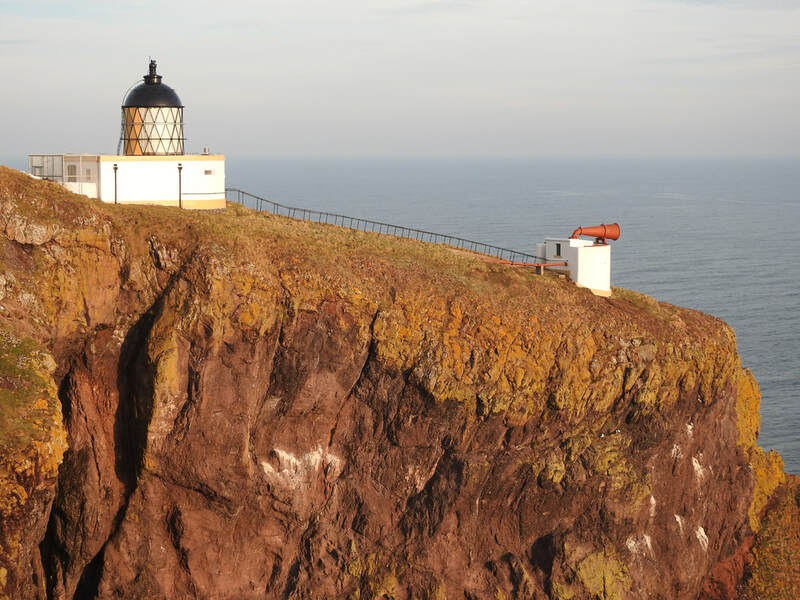 With boat trips along the coast from the harbour to view the St Abbs Head lighthouse from the sea this is the location for your day out! Following The Lights books are available to purchase from the visitor centre shop, along with unique limited edition lighthouse canvas and greetings cards with all proceeds from sales going direct to support the local RNLI. Plan you dates in advance, please help spread the word and remember to keep Following The Lights! help wanted! 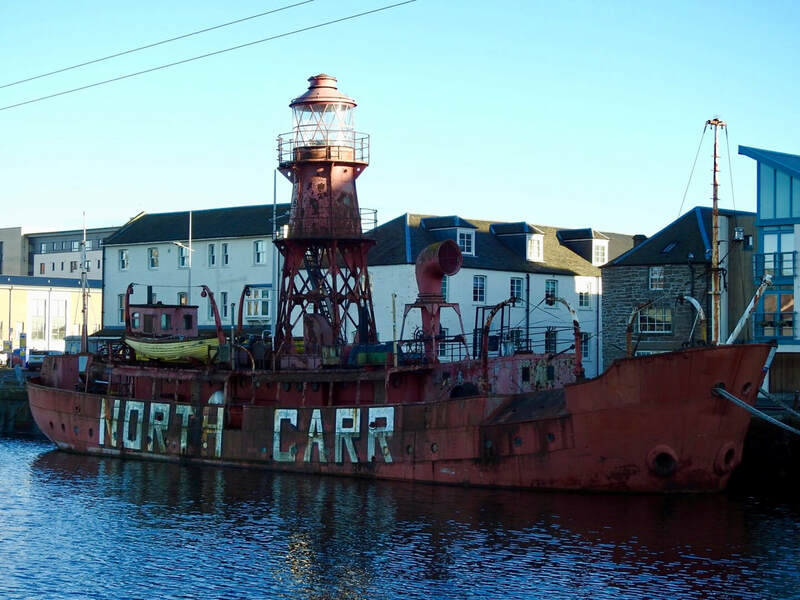 North carr Lightship Dundee! Whilst on my visit to Dundee to setup at Discovery Point, I was delighted to see for the very first time the former lightship The North Carr. The North Carr is currently run by Tay Maritime Action (Taymara) and is looking for information from former staff or family members, any historical items or documents relating to this wonderful peice of our maritime history. If you can spare any time to help bring the ship back to life they would appreciate your time. Do you have electrical, engineering or painting experience this would all be of great help. I was delighted to be given a special tour of the ship on the day and very impressed at the condition of the engines. Thank you to the team at Taymara for this opportiunity. The team would be delighted to hear from you. Please help spread the word! Discover Thomas Smith, Robert Stevenson, Thomas, Alan and David Stevenson, Robert Louis Stevenson, Lloyd Osborne and more with items from the Following The Lights Collection. The exhibtion starts on Friday 8 February and running until 28 March 2019. Delighted to say, Fingal Edinburgh is now open! The luxury five star hotel at the Port of Leith Edinburgh, a short distance from the Royal Yacht Britannia. 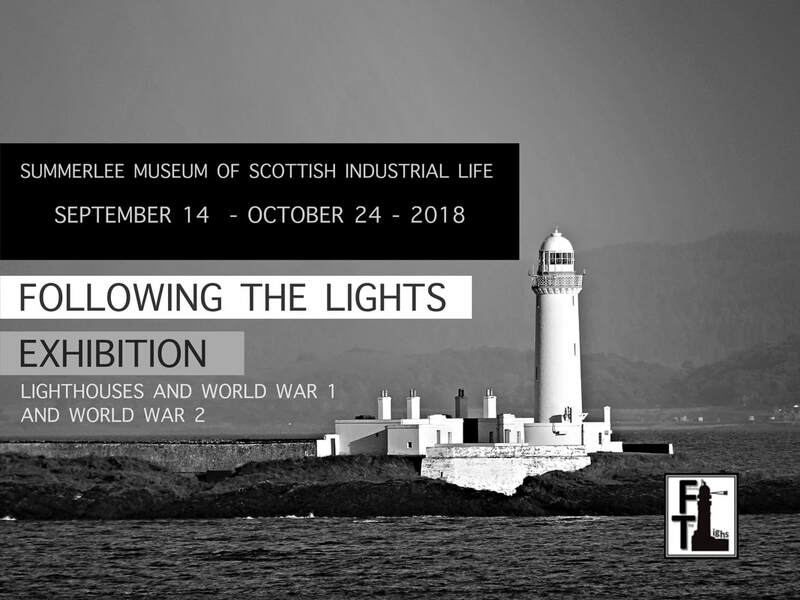 Following The Lights, limited edition canvases, limited edition greetings cards, and Following The Lights books are on sale in the Summerlee Museum of Industrial Life, Coatbridge. Have a great day out, ride the tram and pick up something extra special for Christmas in the sale! Delighted to announce the first Following The Lights exhibition of 2019. Discovery Point Dundee will be hosting the exhibition from 14 February until 28 March 2019. If you missed the 2018 exhibtions, you can add these dates to your diary now, do not miss out on a great day out! Two designs feature on my Christmas and New Year Cards this year. The first one is a black and white photograph of Ornsay Lighthouse taken from the Isle of Skye. Personally, I liked the snow in the background of this image. The second was art work, I created the northern lights behind a drawing of Corsewall lighthouse. Lighthouses and World War 1 and 2 Theme Exhibition starts 14 September with a static display of items. If you visit remember to scan the QR Code to find out about the items or visit the unique webpage. The extended exhibition will include some new items from the Following The Lights Robert Louis Stevenson collection including the 1898 1st Edition book of A Lowden Sabbeth Morn, featuring illustrations by A. S. Boyd, to accompany this book, on display will be a large original ink illustration signed and created for this book by A. S. Boyd. 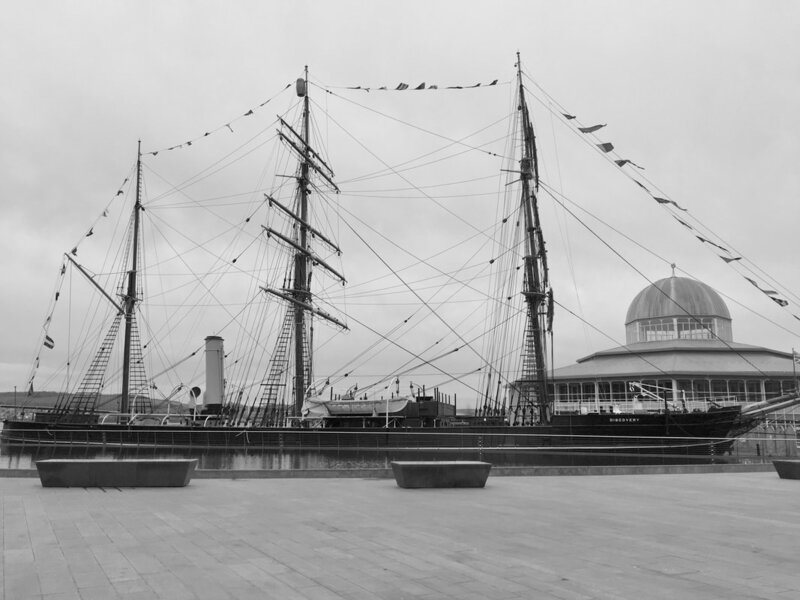 10th August 2018 will see the start of the photographic canvas exhibition and sale outside Royal Yacht Britannia, Ocean Terminal Leith. Visitors can view the selected canvas on display and if interested in purchasing the item can look the price up on the price list on the first pilar opposite Royal Yacht Britannia entrance then pay in cash at the Ocean Terminal shop called the DARK ROOM next door to ZIZZIS. On the 18 and 19 August a special Lighthouse and Robert Louis Stevenson family archive exhibiton will take place at this same location. On display will be lighthouse artefacts as well as documents, book and photographs connected with Robert Louis Stevenson. Thank you in advance to everyone for visiting the exhibtion. To celebrate the first anniversary of the release of Following The Lights book, I decided to take my personal collection of lighthouse artefacts on tour. Unknow to me at the time, the 12 of July also marked the date Robert Stevenson died 167 years ago, so in a strange way for me the event also celebrated his work, his life and his family. Feedback from the near 200 visitors who travelled from as far as Singapore, USA, Canada and Europe informed me of the success of the event. Many of the items over 100 years old, brough gasps of surprise, and almost tears, from some of the stories connected with these unique and rare items, which shine a new light on a forgotton past from the lighthouse service and more around the British Isles. The tour moves on now to the Ocean Terminal in Edinburgh where a selection of one off limited edition canvases have been produced and will be on sale for the very first time. These stunning unique items will only be availble at this event which runs from 10 August until 30 August 2018, try not to miss it! To help celebrate, why not come and view some of the artefacts from my collection. ​Join me for International Lighthouse weekend on 18 and 19 August 2018 at Ocean Terminal top floor outside the Royal Yacht Brittania, learn some of the history of Robert Louis Stevenson and his family and have a look at his mother and fathers photographs which are brought together for the first time since 1880.